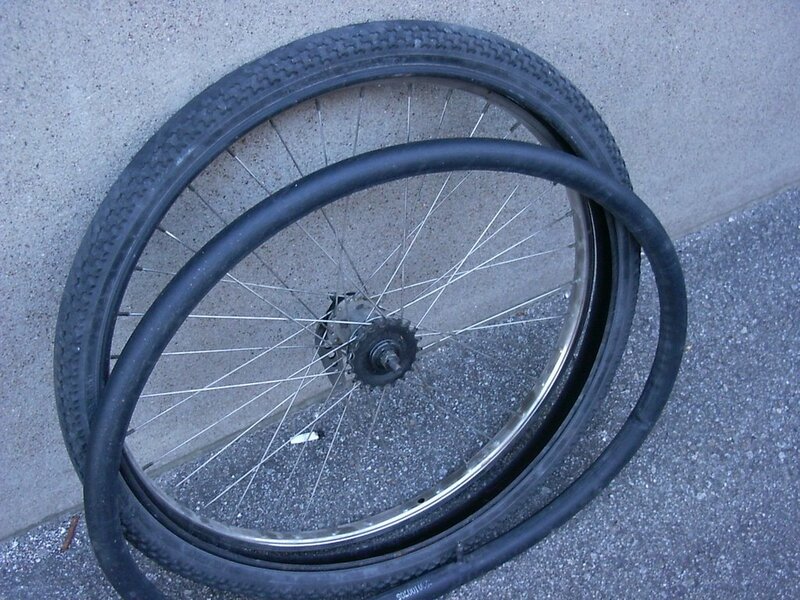 Free advice on how to fix your bicycle: Fixing a flat orThe flat tire fraud! Fixing a flat orThe flat tire fraud! First off, remove any remaining air in the tube if there is still some left. Take the tire off the wheel. This can be done by hand, but sometimes the use of tire spoons is necessary. Removing the tire one sidewall at a time is also easier. Now, put the wheel up against a wall, put the tire against the wheel at the same place it was on the rim and finally put the tube against the tire at the same place it was in the tire. You can use the valve on the tube and the valve hole on the rim to help you. 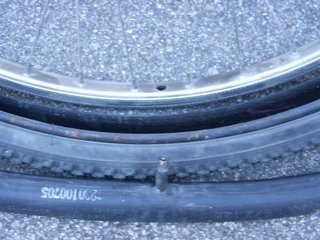 You may ask:"but why do all this", because installing a new tube will not tell you WHY you had a flat and you might end up with another puncture. While it is up against the tire, fill the bad tube with air until you hear the air coming out of the hole. Find the hole and look where it is compared to the tire and wheel. One puncture on the outside radius of the tube means that you rolled on something sharp. To make sure that it's not there anymore, feel the inside of the tire for anything sharp and remove it. Careful now, if it punctured your tube, it will puncture your skin. Also, it is possible that your tire is worn out and needs to be replaced, bald tires are not too strong against a sharp little rock. 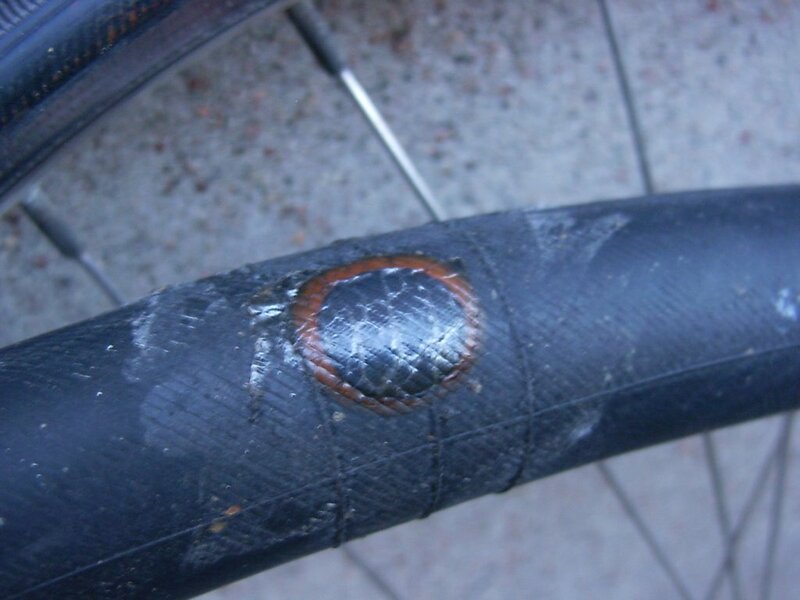 One puncture on the inside of the tube radius means that the rubber tape on the inside of the rim is missing or displaced and a spoke punctured it. See where this happened in relation with the wheel and fix the problem. If the tape is broken, you can use good old duct tape to fix it. One puncture on the side of the tube. Check your tire sidewall, you may have a busted tire that exposes your tube. Time to change it. Star shaped puncture anywhere on the tube. That's over inflation and your tube has blown up. If you were fortunate enough to be there when it happens, it makes a pretty cool loud BANG! If you were unfortunate enough to be there when it happened and you were actually riding, chances are you are reading this from a hospital bed and it wasn't cool. Always inflate within 5 to 10 psi of the posted limit on the tire. You need to leave room for climate changes and heat from the rim when applying the brakes. This is important when riding in hot weather. So now you have figured out what caused the flat and your ready to patch it up and go.....NOT! Buy a new tube and install it. A patched up tube is trouble waiting to happen at the least desired moment. Patch up your old tube and check that it is well patched but keep it as a spare on your bike. It will bring you home if you get stuck. Put the new tube in the tire after inflating it just barely so it has shape. This will make it easier to put in the tire. If you have put too much and this prevents an easy re-entry, simply remove the excess air. Put the tire back on. Depending on many factors, this could be easy or simple. If you cannot do it by hand, you will need tire spoons to work the tire back on the rim. Just be careful not to pinch the tube while using those. Once your tire is back on the rim, put the wheel on its side, on the ground and put in about 10 psi in it. Stop to check if the tire is properly seated all around the rim on both sides. I failed to do this once and as I was about to release the air after noticing a huge tube balloon on a 26 inch wheel....BOOM! My wife came running into the garage thinking I was shot with a 12 gauge! My ears rang for an hour! Ok, enough with my war stories, now that the tire is evenly set all around the rim, on both sides, pump it to the proper pressure and reinstall the wheel. Make sure that the wheel is seated properly in the frame or fork that all the bolts are tightened before leaving on your next ride. Tip of the day: If you ever notice a slash in the sidewall of the tire before it blows and you still have a good distance to go, use a folded dollar bill and shove it between the tube and the inside of the tire. Reinflate and you should be good to go. I've been had like that once. Thanks for the info. As a mechanic in a bicycle shop, I think you are doing a great disservice by suggesting that people should be wary of taking their bike to the shop for a flat repair. I have been in the business for 20 years and have never encountered a mechanic who would intentionally overlook a potentially recurring problem just to bring the customer back for another flat repair. Has it ever happened? I'm sure.. But not statistically enough for anyone to be paranoid about it. Beside that, nice blog. you have to be joking! don't bother with a repaired tube? surely you must be no good at repairing them! I've done 100's in my life and have had less than 1% problems. I have a bike trailer that had 13 punctures at once, i couldn't change the tube as all shops were closed and I desperately needed to use it. That was at least 18 months ago and its still going strong. I agree with chrisfrelin, I worked as a mechanic for six years and never met a mechanic dopey enough to try that, it would be a sure way to not get any repeat business. I also agree with the next comment about patched tubes. If there is going to be a problem with a patched tube, you will see it right away. My last piece of wisdom is to realise that changing a tube is not nearly as easy as it looks. Most people will have a very hard time getting the tire off and then getting it back on and seated properly. If it is not seated, it will blow off the rim. You also want to make sure the wheel is seated in the frame correctly and that the qucik release is properly secured. Best bet is to find someone with experiance to teach you how or find a friendly mechanic who will walk you through it. Looks like a great blog though, keep up the great work! One thing I'd add is that you should figure out if the tire is too worn out and that's why you are having flats. And some bikes are junk and are going to give problems with tires. A bike mechanic probably isn't going to tell you that the problem with your bike is that it is junk. I assure you, they don't want to see it again, no matter how much money they get out of it. People should definitely learn how to diagnose flats. But almost every bike shop will do a pretty good job. Many tire problems repeat immediately if not diagnosed properly. And there is nothing worse than doing a repair and getting it back a day later. Chris: I've replied to you by email, but to share with everyone, let's just say that I've seen this often in my area. One customer came to me after going back at the same shop three times before I pulled a glass piece from his tire. No more flat tires after that. I've received brake cables in a shop after asking for a derailleur cable and the cherry on the sunday is getting a bike from a rider that just got his ride back from a shop with the pedals at 12 and 3 o'clock! I'm sure your shop is good, but not all of them are. anonymous: I don't make a living at fixing bikes, it's my passion. I don't even patch my own tubes. My time is money and paying $5 for a new tube is worth it for me. If you enjoy patching tubes, that's great. I just hope you don't do high speed riding downhill, those numerous patches can unbalance your wheels, especially the front one. I'll add the notes in the article for worn tires and checking the seating of the tire on the rim. It's hard to remember everything when writing it down when it's so easy to do after a couple of thousand times. Thank you all for your valuable comments. OK, fair enough I take your point that patches could unbalance a tyre, but there would surely have to be a lot to make that much difference. There aren't hills around here and I ride an MTB with thick tyres. I can see that doing 60mph downhill on a racer with skinny tyres 'might' be affected by about 6 or so patches in the same area but do you really feel any difference at real bikes speeds? Can't say I have, never even considered it. I've been fixing punctures since I was 6 or so, its not that hard, repair kits have instructions! If you cannot follow them then maybe you are better off buying another tube, but then you might not have the IQ to figure out what caused it anyway! Gerry, I've got a question. it seems whenever one of the kids want to go for a ride, the tires on the bikes are always low. These are somewhat newer bikes but not ridden very often. I haven't checked for leaks since the tires are not completely flat but I'm wondering if by just having the bikes sit in the garage, will the air leak from the tires? Thanks for your help. Jon, you are correct. Rubber is porous at a microscopic level and there is always air seeping out. That's why tire pressure as to be checked on a regular basis. If you lose a good quantity of air within 24 hours though, then you have a slow leak somewhere. The best way to find out is to pull out the tube from the tire, pump it full of air and immerse it in water. You'll notice right away if and where you have a leak. sharp object causing the puncture. footlet from a shoe store they have for women to test shoes. That's a great tip. Thank you for sharing. Around here we have a lot of thorns. They are a really evil variety with multiple points. We call them goat heads. I don't even consider taking a bike out for a ride unless I have slime in the tires. The last ride I went on. My tire had 6 thorns in it, and my son's had 4. They sell plastic strips that go between your tube and your tire, but they are never wide enough and make it much harder to install the tire. For my money, no MTB should be out there without slime in the tube. This has been useful, thanks. Ted, you said slim in the tires, then slime in the tube. I'm assuming you mean putting slime on the inside wall of the tire providing lubrication for the tube...? That's a good idea too, thanks. ok maybe you can help me. Im trying to patch a tire. Ive patches many tired before, but this time i have a new problem. Im working on an old schwinn and the tires on it are SO tight. Ive tried everything to get them off. even sharp objects like chisels, I broke the tool I bought specifically for this project trying to get the dang thing off. My 2 cents worth: "take it to a bike shop" instead of ruining your rim and also your tools. With all due respect, this is a how to blog for people who want to fix their own bikes. Flat repair is the most basic thing you can do on a bike and it is something that WILL happen at some point. Besides, it will most probably happen in the middle of nowhere and the nearest bike shop will be miles away. You forgot to mention dirty hands (Just couldn't resist that one). I have frequent flat tires lately on my rear wheel. Now the tubes has three patches already within 2 weeks. I found no sharp objects in the tire. Tube and tire are only 3 or 4 months old. Could it be quality problem? It could also be a stroke of bad luck. I've had the same problem at the end of this season after 10 years without a single flat. I've had 2 punctures in the same rear tire and I have yet to find the guilty party stuck in the rubber. Go figure! "Then you have been the victim of poor workmanship or a mechanic with low work ethics. Not all bike shops are bad, most of them are pretty good..."
I find this particularly offensive. You can get a flat ANYTIME, not just a year after you had one fixed, but you can ride over a thorn or piece of glass not only days after having one repaired, but going down the street immediately after having it repaired... on the SAME DAY! Imagine that! I've fixed flats... changed an innertube, made sure nothing was left inside the tire, and get a second one. What a stupid statement to make! It's already difficult enough to convince a person that these are the laws of chance, and this can happen anytime... we don't need some blog telling them their are right to suspect a bike shop! No I don't own a bike shop, btw. I was a racer in the 80's, used to ride 100-150km/day, was team trainer successively for 3 different racing teams after that... so believe me, I have plenty of experience, and I've had more than my share of flats. What you write is myopic and irresponsible." I have witnessed this happening 3 times to a friend within a week in the same bike shop. I ended up repairing the flat for free for him and found a tiny shard of glass that wasn't removed in the first place. Like I said in the piece, not all bike shops are like that and in retrospect this is most probably an exception. But I've seen more stupid things come out of bike shops and every body shouldn't take for granted that anybody wearing an apron in a place with bike wheels is perfect. The buyer, or cyclist, should always beware. For that reason, I still refuse to remove the piece or change it in any way. However, I always welcome a debate over any of my writing. I'm going to have to back up Gerry's suggestion that you can't just assume that the bike repaired at a shop will be fixed. I've had both good and bad experiences at bicycle repair shops. I think bicycle mechanics are human and ever after many years they can still make mistakes. I think the debate is around semantics as Gerry is perceived as attacking the mechanics credibility. I think Gerry is just saying that to blindly trust on perfection is folly. I think all Gerry is saying is that both the customer and the provider should check the repair with scrutiny. This is not to doubt either party, but to ensure quality. Then if a problem is noticed, one should notify it in a polite manner. Not to insult to one's profession, but as the last step in a service that was provided. You can pop it off with your fingers or use a tire spoon if it sits too tight. Check out my free maintenance book for beginners, the link is near the top of the blog for a more detailed explanation. No stupid questions here, so don't worry about it. Kids bikes, the smart way. From wreck to ride or how not to buy a new bike. The one tool you absolutely need!